I made this the other night and it was a big hit! Believe it or not this is a Weight Watchers recipe. I did Weight Watchers after having my son to help lose the baby weight. Not to sound like an ad for them, but I found so many delicious family friendly recipes on their site. I was so surprised! 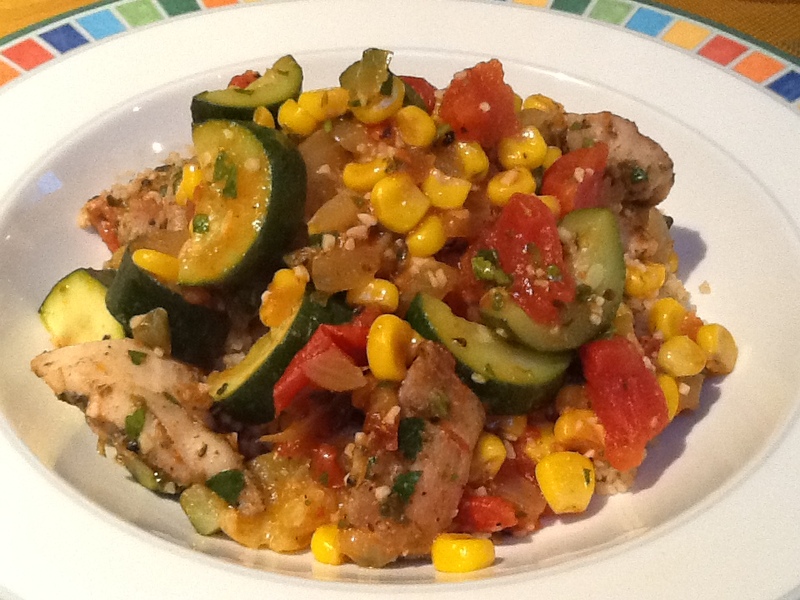 This recipe is full of yummy, heathy goodness for the whole family. I served this over whole wheat couscous. This is for little ones 12+ months and mommies and daddies of all ages. In a small cup, combine oregano, cumin, salt and pepper. Place chicken in a bowl and toss with 1 1/2 teaspoons spice mixture; reserve remaining spice mix. Heat 1 teaspoon oil in a large nonstick skillet over medium-high heat. Add chicken and sauté until browned, about 5 minutes; remove to a plate. Heat remaining 1/2 teaspoon oil in same skillet over medium-high heat; add onions and sauté until lightly browned but still crisp-tender, about 5 minutes. Add zucchini and corn to skillet; sauté until zucchini is lightly browned, about 4 minutes. Add garlic and reserved spice mixture. Reduce heat to medium-low; cook, stirring, until fragrant, about 30 seconds. Stir in diced tomatoes and their sauce; bring to a simmer over medium heat. Add chicken and 1/4 cup water (to prevent chicken from sticking to pan); cover, reduce heat to medium-low and cook until chicken is cooked through about 5 minutes. Remove from heat and stir in cilantro; serve and enjoy! Remember to make sure the pieces are small enough for your little one so they wont choke.